In receiving the Financial Sector Development Strategy (FSDS) Document, it gives me great pleasure to state that today is a defining moment in the history of development of our financial system as we embark on undertaking the recommendations contained in this Document. I am sure the implementation of the contents of this Document (FSDS) will also assist in meeting some of PNGs commitments arising from the APEC meetings in 2018 and the Vision 2050 Policy of the Government.  Develop an institutional framework for Sovereign Wealth Funds Management that will ensure financial stability. 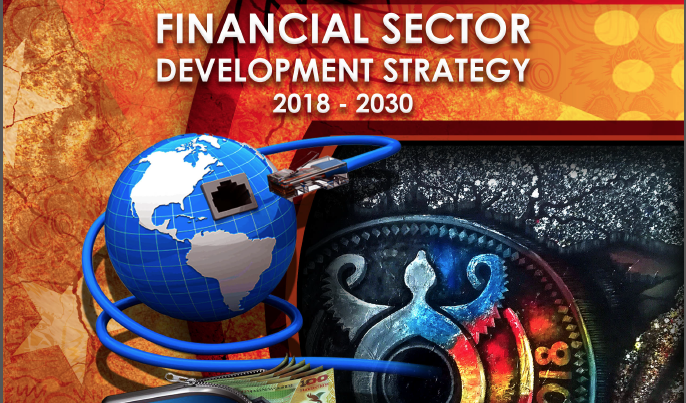 The Financial Sector Services Review (FSSR) Report and the resulting Financial Sector Development Strategy (FSDS) Document are part of the implementation of the FSAP Report of 2011. The FSDS will assist in strengthening the financial sector by addressing critical areas that are necessary for taking PNG to the next stage of inclusive development and growth. Total assets of the financial system was K51.0 billion at the end of September 2018 with 74.2 percent accounted for by deposit taking institutions and 25.8 percent accounted for by superannuation funds and life insurance companies. Although the number of financial institutions in PNG is few, they have been well regulated and supervised and consequently, with emphasis of inclusive banking, this has led to an increase in the growth of the financial sector over the years. In the last 10 years, the assets of the banking system grew by a staggering 142 percent to K51.0 billion in September 2018 from K20.9 billion in June 2009; with some local financial institutions such as BSP and Credit Corporation, expanding their operations in the Pacific Islands Countries. There has also been a strong growth in the number of microfinance intuitions, mobile money operators and money changers including financial services excess points for ATMs, EFTPOS and agents. The financial sector plays a key role in the lives of Papua New Guineans. A vibrant and sound financial sector is an essential foundation for a market economy. For example, the assets of the financial sector accounted for 63.9 percent of nominal GDP in September 2018, reflecting the important role financial sector plays in the economy. Financial sector reforms, including inclusive banking, reforms to the securities commission and housing of general insurance can bring about an increase in the scope of monetisation and enable rural dwellers to contribute meaningfully to development and promote financial stability. The FSDS charters a new course for taking PNG’s financial services sector to the next level of development that will ensure deepening of our capital market, enable trading of sovereign bonds and potentially give rise to a secondary market for government securities, improve efficiency of our payments system, reducing the number of unbanked population, and create an avenue to protect the vulnerable through consumer protection that is supported by appropriate regulation. To ensure smooth implementation of the FSDS, a new financial sector governance and coordination policy committee called PNG Financial Services Council will be established and will include the Governor of the Central Bank, the Secretary of the Department of Treasury and the Chair of the Securities Exchange Commission PNG. Other members will be invited as and when necessary. The more immediate are the developments in the National Payments System, efforts on Financial Inclusion and Consumer Protection of Financial Services. A lot of work has already been done on these fronts but many challenges still remain. These include the Retail Electronic Payments System (REPS) and the need to apply Fin-tech solutions to advance banking services in rural communities using branchless banking concepts. In respect of financial inclusion, a key element will be engagement with the Department of Education for developing Financial Inclusion Curriculum for primary and high school children so that future financial inclusion programs can be taught through the education system. If and only when this happens, financial inclusion conducted by the Bank can focus on depleting the stock of adult financially illiterate population, with the objective of reducing it to zero over 10-15 years. The developments in the medium term include those involving the capital markets such as bond issue, and secondary trading of government securities. These developments will potentially include restructuring the stock exchange, the securities commission, and institute necessary infrastructure for efficient trading on the exchange. In the longer term, efforts will be focused on increasing the trade in equities to deepen the POMSox as well as bring some of the unregulated institutions such as landowner trust funds to be regulated by the securities commission. Finally, I wish to thank the Deputy Prime Minister and Minister for Treasury, Hon. Charles Abel for entrusting the document with the Central Bank for its implementation. The Bank will endeavour to implement the contents of this Document as I have just outlined.